I recently had the opportunity to talk with Ovie about Volume Shadow Copies (VSCs) on his CyberSpeak podcast. It was a great experience to meet Ovie and see what it’s like behind the scenes. (I’ve never been on a podcast before and I found out quickly how tough it is to explain something technical without visuals). The CyberSpeak episode May 7 Volume Shadow Copies is online and in it we talk about examining VSCs. In the interview I mentioned a few different things about VSCs and I wanted to elaborate on a few of them. Specifically, I wanted to discuss running the Regripper plugins to identify volumes with VSCs, using the Sift to access VSCs, comparing a user profile across VSCs, and narrowing down the VSC comparison reports with Grep. One of my initial steps on an examination is to profile a system so I can get a better idea about what I’m facing. I information I look at includes: basic operating system info, user accounts, installed software, networking information, and data storage locations. I do this by running Regripper in a batch script to generate a custom report containing the information I want. I blogged about this previously in the post Obtaining Information about the Operating System and I even released my Regripper batch script (general-info.bat). I made some changes to the batch script; specifically I added the VSCs plugins spp_clients.pl and filesnottosnapshot.pl. The spp_clients.pl plugin obtains the volumes monitored by the Volume Shadow Copy service and this is an indication about what volumes may have VSCs available. 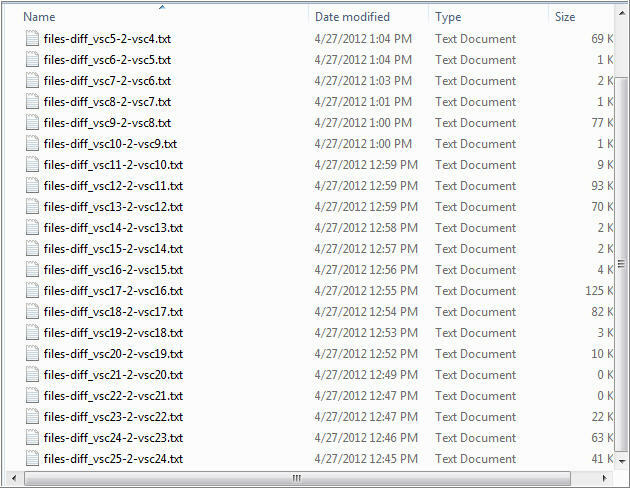 The filesnottosnapshot.pl plugin gets a list of files/folders that are not included in the VSCs (snapshots). The information the VSCs plugins provide is extremely valuable to know early in an examination since it impacts how I may do things. While I’m talking about RegRipper, Harlan released RegRipper version 2.5 his post RegRipper: Update, Road Map and further explained how to use the new RegRipper to extract info from VSCs in the excellent post Approximating Program Execution via VSC Analysis with RegRipper. RegRipper is an awesome tool and is one of the few tools I use on every single case. The new update lets RR run directly against VSCs making it even better. That’s like putting bacon on top of bacon. There are different ways to access VSCs stored within an image. Two potential ways are using Encase with the PDE module or the VHD method. 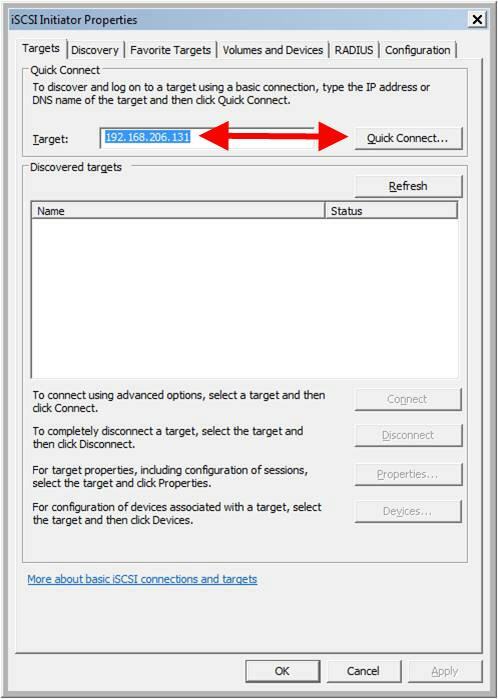 Sometime ago Gerald Parsons contacted me about another way to access VSCs; he refers to it as the iSCSI Initiator Method. 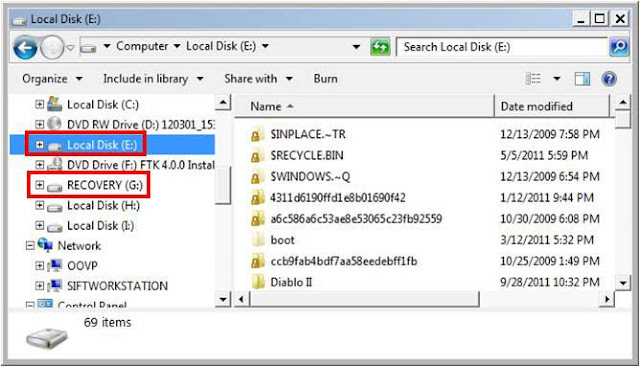 The method uses a combination of Windows 7 iSCSI Initiator and the Sift workstation. I encouraged Gerald to do a write-up about the method but he was unable to due to time constraints. However, he said I could share the approach and his work with others. In this section of my post I’m only a ghost writer for Gerald Parsons and I’m only conveying the detailed information he provided me including his screenshots. I only made one minor tweak which is to provide additional information about how to access a raw image besides the e01 format. A raw image needs to be available within the Sift workstation. If the forensic image is already in the raw format and is not split then nothing else needs to be done. However, if the image is a split raw image or is in the e01 format then one of the next commands needs to be used so a single raw image is available. 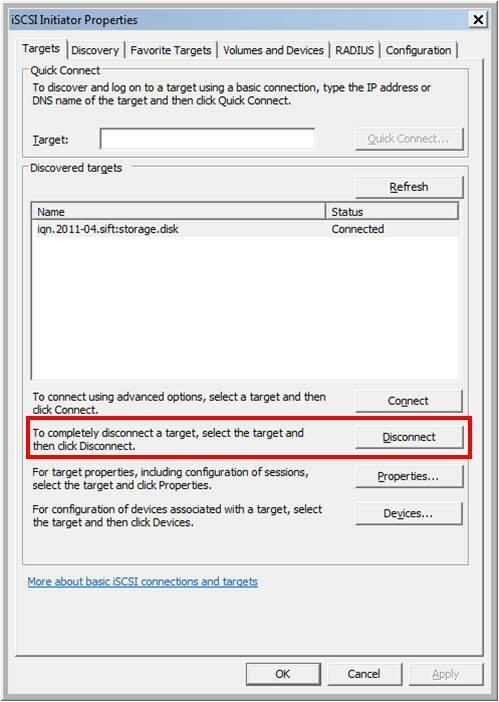 By default, in Sift 2.1 the iSCSI is turned off so it needs to be turned on. The false value in the /etc/default/iscsitarget configuration file needs to be change to true. 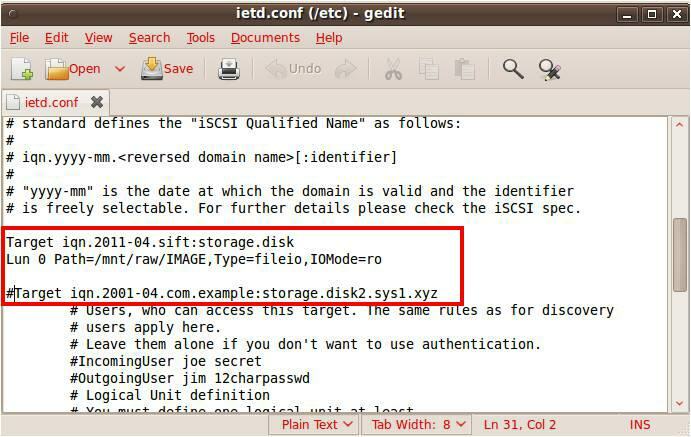 The commands below uses the Gedit text editor to accomplish this. The Sift workstation will need a valid IP address and the Windows 7 host must be able to connect to the Sift using it. Enter the Sift’s IP address then select the Quick Connect. A status window should appear showing a successful connection. 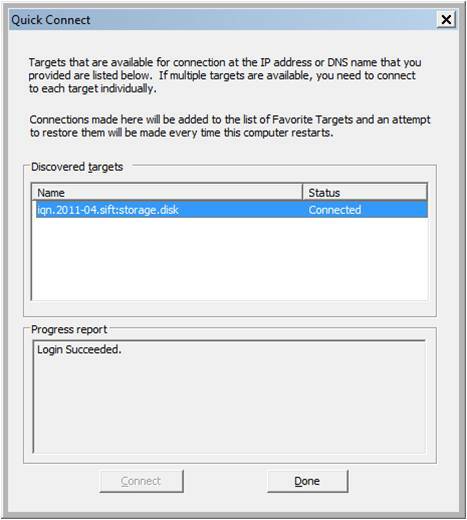 Windows automatically mounts the forensic image’s volumes to the host after a successful iSCSI connection to the Sift. In my testing it took about 30 seconds for the volumes to appear once the connection was established. The picture below shows Gerald’s host system with two volumes from the forensic image mounted. If there are any VSCs on the mounted volumes then they can be examined with your method of choice (cough cough Ripping VSCs). Gerald provided additional information about how he leverages Dave Hull’s Plotting photo location data with Bing and Cheeky4n6Monkey Diving in to Perl with GeoTags and GoogleMaps to extract metadata from all the VSCs images to create maps. He extracts the metadata by running the programs from the Sift against the VSCs. 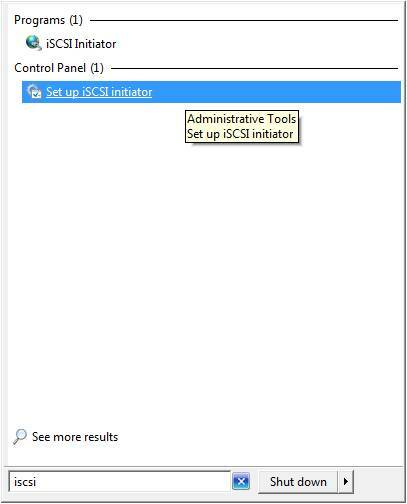 Another cool thing about the iSCSI Initiator Method (besides being another free solution to access VSCs) is the ability to access the Sift iSCSI service from multiple computers. In my test I connected a second system on my network to the Sift iSCSI service while my Windows 7 host system was connected to it. I was able to browse the image’s volumes and access the VSCs at the same time from my host and the other system on the network. Really cool…. When finished examining the volumes and VSCs then you can disconnect the iSCSI connection (in my testing it took about a minute to completely disconnect). I won’t repeat everything I said in the CyberSpeak podcast about my process to examine VSCs and how I focus on the user profile of interest. Focusing on the user profile of interest within VSCs is very powerful because it can quickly identify interesting files and highlight a user’s activity about what files/folders they accessed. Comparing a user profile or any folder across VSCs is pretty simple to do with my vsc-parser script and I wanted to explain how to do this. The vsc-parser is written to compare the differences between entire VSCs. In some instances this may be needed. However, if I’m interested in what specific users were doing on a computer then the better option is to only compare the user profiles across VSCs since it’s faster and provides me with everything I need to know. You can do this by making two edits to the batch script that does the comparison. 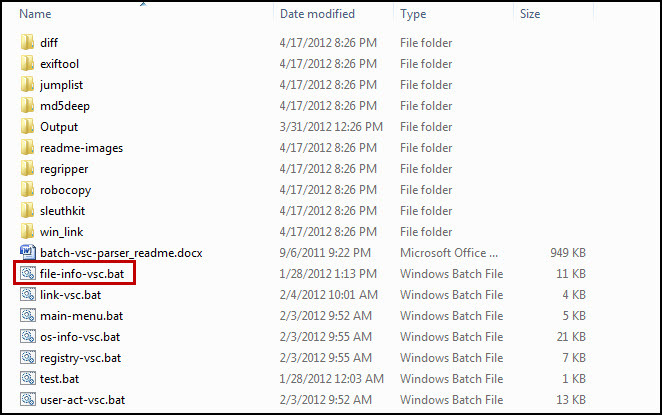 Locate the batch file named file-info-vsc.bat inside the vsc-parser folder as shown below. Open the file with a text editor and find the function named :files-diff. The function executes diff.exe to identify the differences between VSCs. There are two lines (lines 122 and 129) that need to be modified so the file path reflects the user profile. As can be seen in the picture below the script is written to use the root of the mounted image (%mount-point%:\) and VSCs (c:\vsc%%f and c:\vsc!f!). These paths need to be changed so they reflect the user profile location. For example, let's say we are interested in the user profile named harrell. Both lines just need to be changed to point to the harrell user profile. The screenshot below now shows the updated script. When the script executes diff.exe there the comparison reports are placed into the Output folder. The picture below shows the reports for comparing the harrell user profile across 25 VSCs. When comparing a folder such as a user profile across VSCs there will be numerous differences that are not relevant to your case. One example could be the activity associated with Internet browsing. The picture below illustrates this by showing the report comparing VSC 12 to VSC11. The report showing the differences between VSC12 and VSC11 had 720 lines. Looking at the report you can see there are a lot of lines that are not important. A quick way to remove them is to use grep.exe with the –v switch to only display non-matching lines. I wanted to remove the lines in my report involving the Internet activity. The folders I wanted to get rid of were: Temporary Internet Files, Cookies, Internet Explorer, and History.IE5. I also wanted to get rid of the activity involving the AppData\LocalLow\ CryptnetUrlCache folder. The command below shows how I stacked my grep commands to remove these lines and I saved the output into a text file named reduced_files-diff_vsc12-2-vsc11.txt . I reduced the report from 720 lines to 35. It’s good practice to look at the report again to make sure no obvious lines were missed before running the same command against the other VSC comparison reports. Staking grep commands to reduce the amount of data to look at makes it easier to spot items of potential interest such as documents or Windows link files. It’s pretty easy to see that the harrell user account was accessing a Word document template, an image named staples, and a document named Invoice-#233-Staples-Office-Supplies in the reduced_files-diff_vsc12-2-vsc11.txt report shown below. I compare user profiles across VSCs because it’s a quick way to identify data of interest inside VSCs. 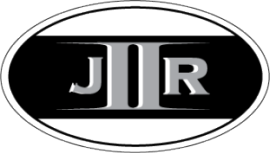 Regardless, if the data is images, documents, user activity artifacts, email files, or anything else that may stored inside a user profile or that a user account accessed.